Wayne E Thompson, 62, died peacefully in his sleep at Quabbin Valley Healthcare in Orange Mass, on October 22, 2018. Wayne was born on September 4, 1956 in Montague, Massachusetts. He was the first son of Joyce (Herk) and Elliot Thompson. He was a long-time resident of Winchester, where he lived most of his life. He graduated from Thayer High School in 1974.Wayne was known by many as “Bing”, to his cousins as “moose” and to his siblings, nieces and nephews as “Waynie Doodles”.He was a man of many names and a personality fitting of them all. Wayne was an avid outdoorsman. 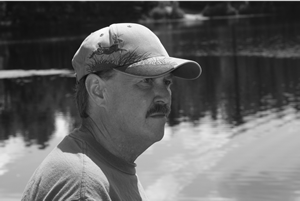 He loved hunting, fishing, hiking and spending time with nature. His hunting and fishing stories began when he was as young as 14 years old and continued until the last year of his life. He was known to tell a few fish tales know and then but his love for the outdoors was second to none. Rather it be fishing with his grandfather or hunting with his uncles, cousins or close friends, Wayne was happiest when he was in the woods or on a stream. He kept time by the sunrise and sunset and could find his way around any woods that he had the joy of walking in. The sun was his compass and the night stars would guide him in the direction of his next days travels. As a teenager and young adult Wayne loved to spend time with his grandfather Herk on the farm in Warwick Massachusetts. It was on that land, in that expansive garden and in his grandpa’s woodshed that he created many lasting memories that he held so close to his heart throughout his life. He was known for his humor and his ability to tell a story. He was the oldest of four siblings and often kept them in stitches at family gathering with his storytelling of family trips to Lake George or family holiday events. He loved to cook and you could always find him at family gatherings deep frying the turkey or smoking a venison hindquarter with his brother in law Barry. When he wasn’t cooking at these events you could most surely find him playing with his nieces and nephews and getting them overly excited about the arrival of Santa or the Easter Bunny. One of the things he loved most was teaching his nephews how to hunt. He waited from the day they were born to share that rite of passage with them. Being in the woods with his nephews (and nieces if they wanted) was something he spoke of on his last days here on earth, A clear reminder that those moments are what he valued most. Wayne was simple man, he loved to live off the land and never needed much more than the clothes on his back and the bare necessities. His Finnish roots defined him and his simplicity is what carried him through some of his most challenging moments in the last stage of his life. He was a diamond in the rough, never needing or wanting to be polished or shined. Wayne is survived by his father, Elliot; Sister and brother-in-law Linda Ebbighausen and her husband, Gary, Karen Thompson and brother in-law, Barry Kellom and brother, Brian Thompson. His five nieces and nephews; Amanda Scaff and her husband Joe Scaff, Beth D’Angelo and her husband Nick D’ Angelo and Ashley Thompson. Jack Marsh III and his wife Nicole Vigneau, Matthew Thompson. He also leaves behind several cousins who he was very close to and many life-long friends. Wayne is pre-deceased by his mother Joyce (Herk) Thompson who passed on December 11, 2010 and his nephew, Trevor Thompson who passed on November 19,2012. Wayne will be dearly missed by his family and so many others that loved him. The family is deeply appreciative and thankful to those who cared for him during his last few years. Upon his wishes, there will be no formal funeral services. His ashes will be scattered in a private service with his family in the places that he loved most. There will be a celebration of love and friendship in his honor in the springtime.